Learn why Stereo Tube Amplifiers are back, and better than ever. 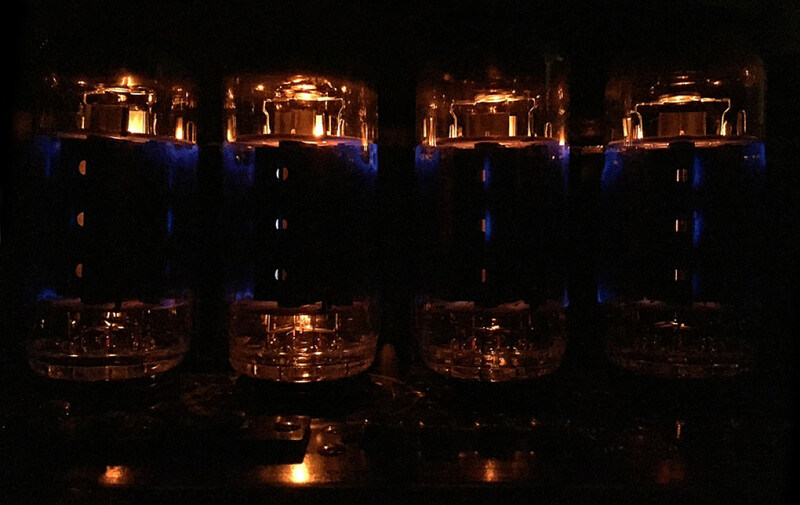 Tubes Are Back – And why for many audiophiles, tube amplifiers never left. Having designed solid state amps to directly compete with the very best tube types, I will begin by stating that solid state technology does have certain advantages over tube technology. However, most of these advantages involve cost, not audio quality. It’s interesting to note that many of the very best ‘Audiophile’ amps made today are tube based. Personally, I find that in general tube amps do sound better than similarly priced solid state amps. I know from experience this is because it’s simply easier to design a really great sounding amp with tubes. 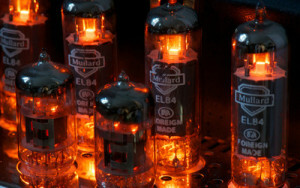 Before the rise of the power transistor in the 1960s, all amplifiers used vacuum tubes. Tube amps were not replaced by solid state amps because of reviewer’s articles, or musical qualities. It was pure economics. Most people don’t realize that the changeover was not fundamentally due to sound quality at all, or that transistors are better than tubes for audio applications. Any competent designer can work magic with both. It was simple cost economics: More watts per buck, more automated fabrication, and less user maintenance. Digital technology aside, the most obvious advantages of solid state amps are ease of ownership and greatly reduced manufacturing costs. The move to “digital” recordings is likewise clearly established, but here again we see a resurgence of the old tech – vinyl records. This antique technology still appeals to young and old alike. Many rave about the resurgence of vinyl, and rediscovering phono preamps, cartridges and turntables. Many people still prefer pure analog— and attest to the superiority of a purely electro-mechanical method of sound transcription. Despite the fact that if not done correctly, a stylus wiggling in a dirty groove can be far from ideal hi-fi, the lowly LP is coming back strong among serious music lovers (it never left for the hard-core audiophiles). This, even over the claims that SACD, HDCD, streaming FLAC, etc. are superior. I will give you that they are much more convenient. But they just don’t sound as good. The reason vinyl is back is not only in the music, its also in the “ritual.” Digital is more convenient – yes – but vinyl not only sounds a bit better (in my opinion), it’s a more “intimate” experience. With vinyl your music experience is more visceral, more physical and more involving. There is a ritual involved to conjure up the best music: mounting and cleaning each record, adjusting and queuing the tonearm. Only when this ritual is learned and practiced diligently do you get the best performance. As for performance, even the highest sampling rate digital recordings still fall a little short of the best vinyl for the ultimate in sound quality (if, that is, you’re willing to spend the time and money for a proper turntable setup, and meticulously follow the ritual). For similar reasons tube amps are coming back. They seem more “organic” to us than their solid state counterparts. Just like spinning vinyl, tube equipment requires user maintenance and user involvement. Their physical presence has more character than the typical sterile solid state box. They also seem more intimate and full of personality to their owners. Not only because of eventual tube replacement— but they glow and have to warm up to the music. Some even require periodic adjustment. And then there’s the pleasure (or frustration) of endless tube swapping – not to mention that great sound quality. Even my old friend Bob Carver is now designing tube amps in his semi-retirement from 40+ years of solid state amp design. Tubes were what he and I were “up against” in the early days of solid state amp design. We may have won that battle, but perhaps we lost the war in a karmic “full-circle” that brings us now to designing tube amps to outperform solid state. However, as good they may be, the new tube amplifiers today are almost always, watt for watt, far more expensive than their solid state counterparts. That’s largely because the economic advantages that drove the adoption of solid state amplifiers still holds true today: It’s far cheaper to fabricate solid state devices than their tube counterparts. Even though the price of vintage amps is gradually increasing due to demand, they are on average far less expensive than new tube amps. They usually go for a small fraction of the cost of a similar performing new amp. As for performance and reliability: A properly restored or modified vintage amp is just as reliable as a newly made amp. And, with a proper restoration and upgrade of components to the latest modern types, they can sound as-good-as, or often better than most new tube amps. The fact is, vintage tube amps are about the only “investment” in audio gear you can make that actually increases in value over time. Add up their generally superior sound quality, low relative cost, constantly increasing value, plus unique retro décor appeal— and you have arguably the best value in today’s high-end audio market… by far!